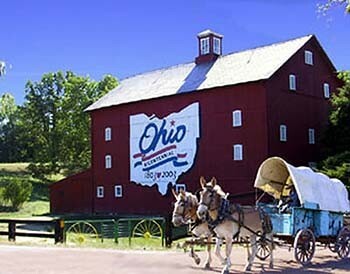 Ohio has been celebrating its Bicentennial all year. 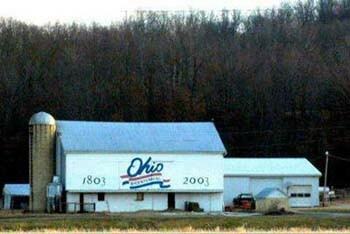 Many barns were painted with the Bicentennial logo. (See photographs below.) A Wagon Train left Martin's Ferry, Ohio, on June 20, and will cross Ohio on the National Trail. It arrived in Reynoldsburg, an adjoining city to Columbus, Ohio's capital and home of the FHWA Ohio Division, on July 4th at the Reynoldsburg Civic Park where it camped the night. After arriving and spending the night at the Ohio School for the Blind, it continued on to the Ohio Department of Transportation (ODOT) where it camped at the ODOT complex. The wagon train will continue to the end of the trail at the Indiana State line where Ohio Governor Bob Taft is expected to greet the "pioneers," and maybe even accompany them back to New Paris for an end of the trail celebration. The wagon train travels from 7 to 14 miles each day depending upon weather and other circumstances. Transportation in America has come a long way! Some Ohio Facts, the ODOT Maps and the Making of U.S. Presidents! Attractions such as the Rock n' Roll Hall of Fame in Cleveland and the U.S. Air Force Museum in Dayton are also featured on the map. The map is available at ODOT and Ohio rest area visitors' centers. 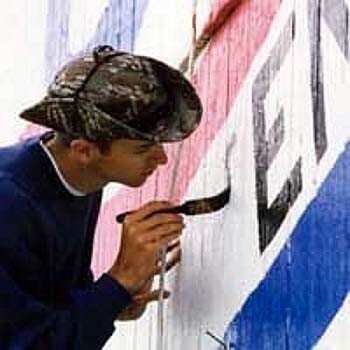 Bicentennial barn artist Scott Hagan sketches and paints each logo by hand. In further commemoration of Ohio's bicentennial, ODOT started the Legacy Tree planting program, which is a project of planting trees and seedlings along Ohio highways to honor Ohio's statehood and the children of Ohio. ODOT teamed up with the Ohio Department of Natural Resources and the Ohio Bicentennial Commission to plant the trees and seedlings. The program is a group effort of several public and private organizations to recognize children as the future of Ohio. Since November 1, 1999, more than 459,000 trees and seedlings have been planted. 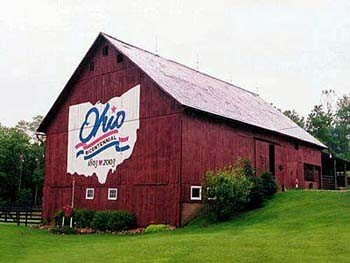 The Ohio Bicentennial Commission's barn painting program started as a unique means of getting free, highly visible advertising. It grew into a cultural phenomenon, with nearly 2,000 Ohio barn owners volunteering their barns for painting, and scores of people traveling across the state to visit as many of the barns as possible. 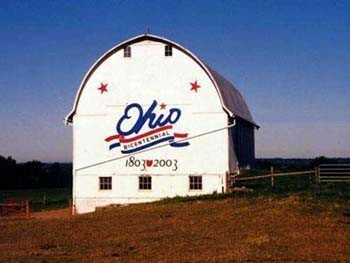 By September 2002, artist Scott Hagan completed his five-year mission of painting the Bicentennial logo on at least one barn in each of the 88 counties. Painted Barn in Coshocton County. Painted barn in Medina County. Painted barn in Knox County.